Born into a family of industrial potters, Steve Foster broke the mould early by becoming a Disc Jockey at the tender age of fourteen. Working in his home town of Redruth at the celebrated local venue 'Room at the Top', Steve later toured Cornwall and Denmark with his mobile disco complete with psychedelic backdrop and light show. 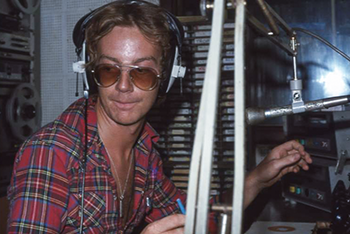 Moving to live in London in the mid 1970s, Steve continued his DJ work in premier night clubs for The Goodhew Organisation and it was whilst in London that he first discovered radio. After training at United Biscuit Factory and broadcasting with L.H.B., Steve joined The Voice of Peace, leaving for Israel in 1978. He returned to Cornwall to join his family ceramics business in 1980 and subsequently took over the family business premises in 2000 to run a successful self storage business which was sold in 2015. 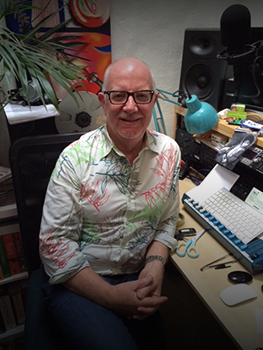 After a gap of some years, Steve’s enduring interest in broadcasting prompted him to join Truro’s community radio station, C.H.B.N., and some years later in 2010 to widen his involvement to Falmouth and Penryn’s Source FM. In both organisations, Steve has played an active role in training new presenters and producing both jingles and advertising material. He has also found time to produce a range of programmes for local DAB station N-Joy. Steve has recently completed a state of the art home studio build and is looking forward to using this new facility to support and extend his local broadcasting work as well as producing new work for Radio Mi Amigo International.